So we may learn to trust. And we ALL come out to play. Please also see www.TheApology.org. This website offers a place to apologize for our racism and to heal so that we may bring the brighter day mentioned in the poem above. Thank you in advance! It Takes Some Time – A Poem By Elana Stanger, L.C.S.W. It takes some courage, too. Yet they’d mean so much. And in fairness, become one with the “us”. It’s everyone that isn’t “White”; it’s everyone but you. And be a better “we”. I choose to care. How about you? How does one show that one cares about healing racism? When so many ingrained social and psychological patterns say we don’t care, how do we show our respect and love? How do we make it clear? 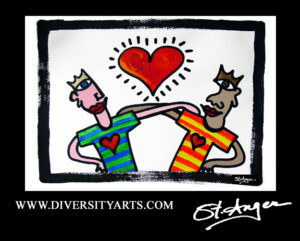 I have been making art on issues related to cultural diversity for the last 25 years. 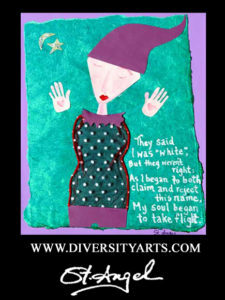 I have been committed to the work of healing racism with my heart, my art, and with my counseling work. It is important to let our actions in the world reflect what’s in our hearts. If what we want in our hearts is justice and peace, we have to let our bodies do the work of justice and peace. This is why I make art and why I more recently became a licensed clinical social worker and psychotherapist. 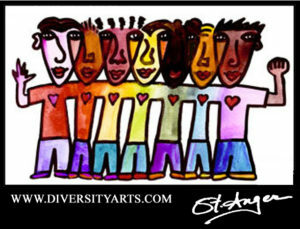 Before I became a therapist, I was a cultural diversity consultant, trainer, and intercultural dialogue facilitator. As a healer and artist, I feel that I am intended to continue doing the work of healing social oppression. Lately, I am starting to think about how to do this work on a larger scale. Please join me. Let us work to build bonds beyond barriers of race and our other cultural identities. As we build true relationships of respect, fairness, equality, mutuality and understanding… peace and unity will be the fruits of our labor. It’s time to work to bring about justice, peace, and Heaven on Earth. I Love You, Too, White People by Elana Stanger, L.C.S.W. I feel that it might be difficult for some White folks to understand that when I support people of color, the White folks can trust that it is possible for me to support White folks at the same time. Because of the ways in which we have all been hurt by racism, which included being pitted against one another and learning erroneously that we are two separate groups of people with opposing goals, it is so hard for us to see that we can all support both groups at the same time. We can care about everyone, all at the same time. What we can no longer condone, however, is injustice and the unjustified advantage of one group over another because of our race, religion, nationality, gender, age, size, sexual orientation, physical and mental ability, etc. Together, we must stand up as one unified body, to end injustice. This call to end injustice, and to pursue justice, is the point of intersection for us all. This is a special time to be alive and at peace in this marvelous universe. Love Everybody by Elana Stanger, L.C.S.W. Hello All Friends Everywhere! 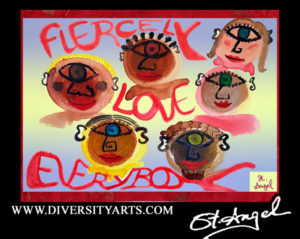 My newest work of art, Fiercely Love Everybody, encourages us to love freely, strongly, and to never let each other go. As members of different cultural groups, we internalized messages that told us to mistrust one another, remain in denial, reject and turn our backs on others whom we perceived to be somehow different from us. However, we now see that was the past. It is now time for us to heal together. We now make the life-affirming decision that as people of diverse cultures, we shall stick together and work together for justice and peace. We shall engage in fruitful dialogue with one another to heal ourselves and develop ourselves into trustworthy, dependable brothers and sisters committed to ending every kind of social oppression in our world. 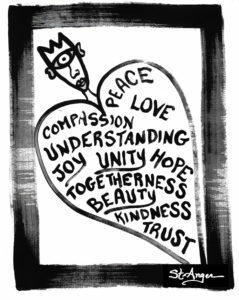 Compassion Peace Love Understanding Joy Unity Hope Togetherness Beauty Kindness Trust by Elana Stanger, L.C.S.W. Build a bridge today between your heart and someone else’s heart. There is too much isolation. Even if your life feels full, someone else may be waiting for you to build your bridge to them, to rescue them and take them off of their island of isolation. Perhaps you’ll recall that your life became full when you, yourself, began building a bridge. At first, you were unsure. Do I have the tools, the materials, the right mindset to reach the other shore safely and in tact? Then slowly and carefully, or maybe rapidly and haphazardly, you gathered your resources and you did the best you could. Perhaps when you found the heart you were seeking on the other shore, you fumbled over your first words, you literally stumbled or tripped on your feet, you made mistakes. Soon, however, you found that the heart on the new shore was more than happy to welcome you because the company of your heart and your mind was all that they had ever hoped for. Anxiety left. Peace prevailed. Good Morning by Elana Stanger, L.C.S.W. Good Morning. This day was made for me, and you, to be happy, to give thanks, to live as one. Breathe in gratitude. Breathe in love. Breathe in unity. Time for forgiveness. Time for peace. Time for solitude. 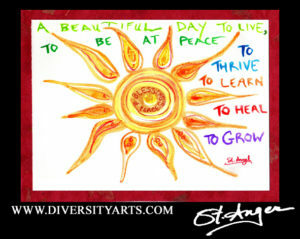 Time to come alive fully bursting with life, creativity, wholeness. Each one of us is special in our own unique way. Let us connect fully with who we are and celebrate ourselves this day and everyday. I give thanks for being able to wake up this morning, get out of bed, and witness the sunrise. I give thanks for the gentle smile that arose on my face. For an open heart, ready willing and able to love. I carry inside of me strength and energy with which to bless the world. I carry power to move mountains. I trust myself to give freely and deeply as I am respected and loved for the significant contributions I make. I love everyone. I work for unity. I work for peace. I work for justice. I believe in life. I believe in love. Black Lives Matter and A White Woman Continues to Care for These Lives by Elana Stanger, L.C.S.W. Watching the video documentary series, Eyes On the Prize, on public television during Black History Month, I am inspired by the courage of all those who stood up for justice during the Civil Rights Era, some of whom even had to give their lives for the cause of racial equality when confronted with the stark hatred that fuels senseless violence. In the video, the African-American thought leader and activist, Stokely Carmichael, was interviewed after a White minister had been killed during a civil rights march, and Carmichael wondered aloud, why did the public suddenly become outraged and more unified at the killing of this White activist while many Black activists had also been killed during their participation in such actions for justice. Their lives… and their deaths… didn’t seem to matter to the general White population. 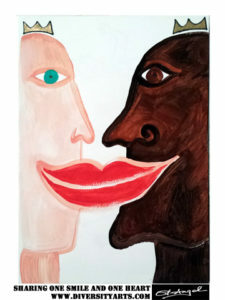 Are we so polarized, Black and White, that we cannot care about the lives of those we perceive to be entirely separate from us based on superficial reasons such as the shade of one’s skin? Before Carmichael spoke these words, I, too, thought them. As a White woman who cares very much about equalizing the playing field for African-Americans, improving the quality of Black and African-American lives, healing racism and social injustice, and being an ally as the pride of African-American people everywhere is growing stronger… I stand with my African-American sisters and brothers who demand to be seen and heard, to be listened to and cared for, to be valued and acknowledged. I want my life to be seen as important, yet not more important than the life of someone who perhaps has more melanin. We are equals. That is how I want us to see each other and be seen by each other. I want my White brothers and sisters to be equally enraged about the murders and the mistreatment of people of African-American heritage, as they would be if the victims were White. Black Lives Do Matter. Black Lives Matter Just as Much as White Lives. I am saying this because I know that many White people feel that only White Lives Matter. And they do feel that White lives matter. They value White lives, Whiteness, and everything White. Yet, I would like my White sisters and brothers to consider all of the African-American nurses and doctors in hospitals everywhere who care for the sick, no matter the color of their skin. Think of all of the caregivers, who care for the elderly and the disabled. Think of all of the teachers, aids, tutors, crossing guards and childcare workers, who care for the children, no matter their race or color. Think of all the leaders in government who make decisions that take into account the needs of people of all races. Think of post office workers, mail carriers, and delivery people who deliver our packages on time. Think of firefighters, emergency medical technicians, and others who respond during life-threatening crises and emergencies. Think of soldiers and veterans who go to battle for us. Think of judges, attorneys, and law enforcement officials who protect us. Think of scientists and inventors who develop their ideas into new products and services that benefit us all. Think of spiritual leaders, religious clergy, and lay leaders who inspire us, offering prayer and encouragement. Think of academicians, professors, researchers, scholars, and authors who shape our minds, nurture our intelligence, and coax our intellect. Think of artists, dancers, poets, and musicians who make us smile with delight and take our souls to new heights. Sports heroes, athletes, and fitness leaders show us we can overcome personal challenges, enjoy teamwork whether we win or lose the game, and enjoy the strength of our own bodies while listening to the heart that beats inside of us. Therapists, social workers, counselors, psychologists, psychiatrists, and healers of all types mend our bodies, minds, hearts, souls and spirits, helping us to invite forward and integrate the parts of ourselves that we once rejected to align with our authentic selves. Fashion leaders, thought-leaders, motivational speakers, television and radio personalities also inspire us to be our best selves. Communicators, mediators, and facilitators help us build understanding, make peace with the others with whom we share the world, and bring justice. Small, local business owners provide for their surrounding communities, while big business owners and CEOs show us responsible leadership and environmental stewardship on an even larger scale. Line workers and factory workers incur callouses during long sleepless hours. Transportation workers help all of us travel to work each day by train and by bus. Food and restaurant employees, and those who run establishments where we all dine, make food that is good and safe to eat. Farmers grow our food, truck drivers deliver it, and supermarket workers stock it on shelves for us to purchase when God blesses us with the financial resources to be able to buy it. African-American people contribute daily to the quality of White Lives and we all depend on them. Let us, White people, contribute daily to the quality of Black Lives and let them count on us. In Comedy, Punching Up Does Not Eliminate Racism by Elana Stanger, L.C.S.W. As someone who enjoys improv and comedy, I am often disappointed by displays of humor that poke fun at one group or another, displays which, in all honesty, aren’t that fun for the person or group being poked. As I had been thinking about this disheartening regularity in both stand-up and sketch comedy, I was listening to a radio broadcast and I heard the interviewer say that in humor, it is better to “punch up”. Punching Up is the pseudo-progressive idea that someone making a comedic joke should take shots at those who have power in society rather than those who do not. We could not be a racist society if those in power did not also have an inferiority complex of some kind. Feelings of inferiority run rampant in our culture. Put-downs are common and praise is rare. This unfortunate circumstance often begins in the parent-child relationship, carries on to the teacher-student relationship, and the supervisor-employee dyad. We are all familiar with the scenario of an employee being wounded by his or her supervisor’s insult at the office, and then going home and lashing out at a family member. The bottom line is, when we are put-down ourselves, we are more apt to put down somebody else. Alternately, when others are kind to us, and speak words of love and appreciation, we are more apt to also be kind and speak words of love and appreciation to those in our midst. Our souls are longing for kindness from others and to express the best in ourselves also. We and our society grow further into the light when we eliminate hateful speech, e.g. put-downs, from our lips. 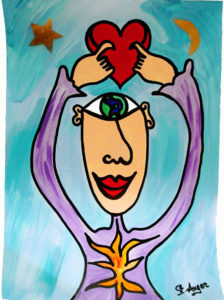 Of course, to do this we must also eliminate hateful feelings and thoughts from our hearts and minds. Here I am speaking of put-downs toward the underdogs in our society as well as those who appear to be the top-dogs. Why? Because anyone who wants to dominate another person in the society we all share together is suffering in some way that is not at first glance visible to the naked eye. We would do best not to rub salt into the place already wounded though it appears to be clear of blemish or scar. For that wound to heal, we must pour in compassion, love, faith, and our belief in that person’s ability to transform him or herself to join with the rest of humanity. When we pour in the love of our hearts, we will help these persons who had previously been in the one-up and isolated position return to earth, get their grounding, get their souls back, and begin again to love their fellow human beings as themselves. We would not have racists in our society, if we did not punch them. We will eliminate racism when we see through the racism and love the human being, though we may also reject the racism and find it reprehensible. After we show our love and commitment to the person and we have listened compassionately to understand their own story of oppression in which they will disclose their own experience of having been punched already in life and the suffering caused by the punch they received previously, their racism will fall away, and the human being will be standing there, ready to greet you and return some of the love you have shared. At that time, you might endeavor to ask the person about their feelings toward people of any other group. After they have been heard by you with loving compassion, they will express less anger, less hatred, less animosity and less of a need to dominate other groups of people. When we punch in any direction, it means someone is being hurt. The goal of comedy should not be to hurt others. Our laughter should not be associated with another’s pain or misfortune. When we lift others up, we too, are lifted. Therefore, let us not “punch up”. Let us lift up. 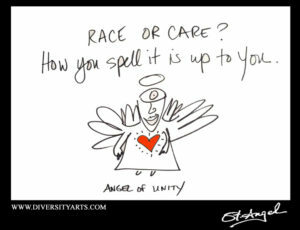 Let us unify all human beings in love.